When you photograph a tall building with your Nikon D3100, D5100, or D7000 and tilt the camera up to get it all in the frame, a convergence or keystoning effect occurs. This effect causes vertical structures to appear to be leaning toward the center of the frame. Buildings sometimes even appear to be falling away from you. (If the lens is tilting down, verticals instead appear to lean outward, and the building appears to be falling toward you.) 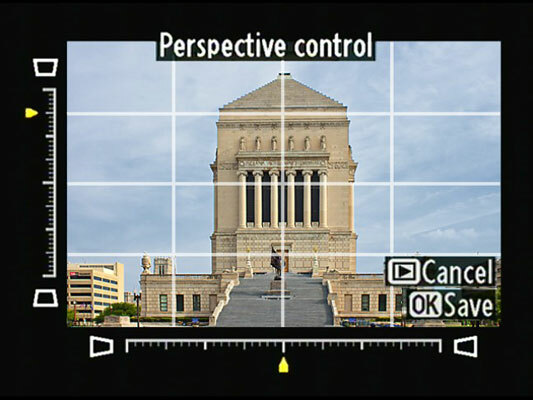 Through the Retouch menu’s Perspective Control feature, you can right those leaning verticals. Note, though, that just like the Straighten tool, you lose some area around the perimeter of your photo as part of the correction process. So when you’re shooting this type of subject, frame loosely; that way you ensure that you don’t sacrifice an important part of the scene due to the correction. Display your photo in single-image view and press OK to bring the Retouch menu to life. Select Perspective Control and press OK.
You see a grid and a horizontal and vertical scale. Press the Multi Selector left and right to move the out-of-whack object horizontally. Press the Multi Selector up and down to rotate the object toward or away from you. Use the guides to get the perspective as close to normal as possible and then press OK to make a copy of the original image with your changes. Depending on the scene, you may not be able to get all structures fully corrected, so just pay attention to the most prominent ones in the scene. For severe distortion problems, you may be able to get better results in your photo editor than on your D3100, D5100, or D7000; in some programs, you can pull and push each side of the image around independently of the others, which enables you to more freely shift perspective than is possible with the type of tool provided in the camera.